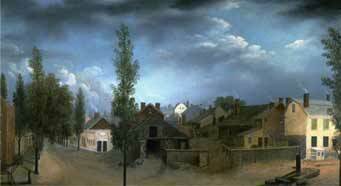 "The air is unusually healthy," noted a visitor, passing through the small village of Brooklyn in 1794. The 100 mostly one-story houses were "chiefly along the shore or scattered without plan," he noted, and the streets were "bad, heavy, and unpaved, so that the smallest amount of rain makes Brooklyn muddy." The village of Brooklyn, directly across the East River from Manhattan, was the funnel through which the food grown on Long Island's rich farmlands passed to New York City. As New York City flourished, so did its nearest neighbor. Rowboats, sailboats, and horse-powered ferries plied the waters of the East River, and speculators and merchants began to buy land along the waterfront. 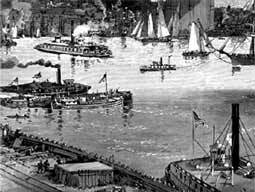 The U.S. Navy opened a shipyard on Wallabout Bay in 1801, and Robert Fulton began a steam-ferry service across the East River in 1814, allowing wealthy businessmen to live in Brooklyn Heights and commute across the river. The turn of the century also witnessed an influx of Irish immigrants. The northern edge of Fort Greene, a center for the growing Irish community, was dubbed Vinegar Hill, after a tragic last stand in the failed Irish Rebellion of 1798. Many of these Irish immigrants found work in the small factories that grew up along the waterfront and in the new Navy Yard. The completion of the Erie Canal in 1825 produced another burst of industrial and economic expansion. Merchants, mechanics, and manufacturers poured into the growing town. Many came from New England, and public life was soon dominated by these Yankee immigrants. The next 25 years saw the town grow into a city with smoking factories along the river, gas lights illuminating the public streets, a public school system, and an impressive city hall. Between 1840 and 1845, the population of Brooklyn doubled to nearly 80,000. This marked the first major wave of European immigration that would transform Brooklyn into the third-largest city in the United States by 1860. Irish peasants escaping famine and Germans fleeing the disruption of a failed revolution poured into the city around the middle of the century. In 1855, nearly half of Brooklyn's 205,000 residents were foreign-born; about half were Irish, with the rest evenly divided between Germans and Britons. A second wave of immigration began in the late 1880s. People from Eastern Europe, including Russian Jews, Italians, and Poles, along with a mixture of Swedes, Norwegians, Danes, and Finns, filled the city. More than one million people lived in Brooklyn at the end of the 19th century -- and more than 30% of them were foreign-born. In 1860, 40% of Brooklyn's wage earners worked in New York City, and ferries carried more than 32 million passengers a year. However, they could not keep up with demand for transport. To ease some of the congestion and link the two great cities, plans to build a bridge were proposed. 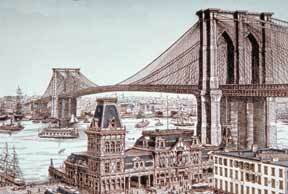 The New York Bridge Company was founded in 1865 and constructed the Brooklyn Bridge, which opened in 1883. The bridge brought a new wave of people into Brooklyn: immigrants seeking relief from the high rents and small apartments of New York City. The city of Brooklyn expanded to accommodate the new population, eventually swallowing up all of Kings County, and itself being annexed by New York City in 1898.